In 1947, the British Air Ministry issued a request in the form of Specification B.35/46 for an advanced jet bomber capable of carrying nuclear bomb. Short and Vickers responded with SA.4 Sperrin and T.660 Valiant. Sperrin was set as program backup while Valiant was awarded for production order. Handley-Page and Avro came up with advanced designs for competition which would become the Victor and Vulcan. Due to the aggression in Europe from USSR, both the Victor and Vulcan were also awarded production contract. The first HP.80 Victor prototype made its first flight in 1952, and the first production aircraft B.Mk.1 flew in 1956. After improved by the more powerful engines, wing design changes and many other modifications, the B.Mk.2 entered service in 1962. 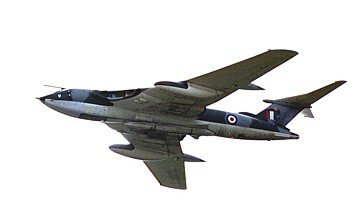 The Victor initially armed with the Blue Steel stand-off missile, and was intended to equip with American Skybolt missile. In 1972, Twenty-four B.Mk.2s were converted to K.Mk.2 tanker. The Victor never called into combat in bomber role but did see action in tanker role for the Falklands war in 1982 and Gulf war in 1991. The last Victor unit was disbanded in 1993.